I grew up car camping with my parents several times a year, but as they've gotten older (early 60s), they basically stopped camping. Recently, they've expressed interest in camping again but I'm concerned that all of their gear is between 10 and 15 years old, bulky, awkward to assemble, and just an overall pain for them. 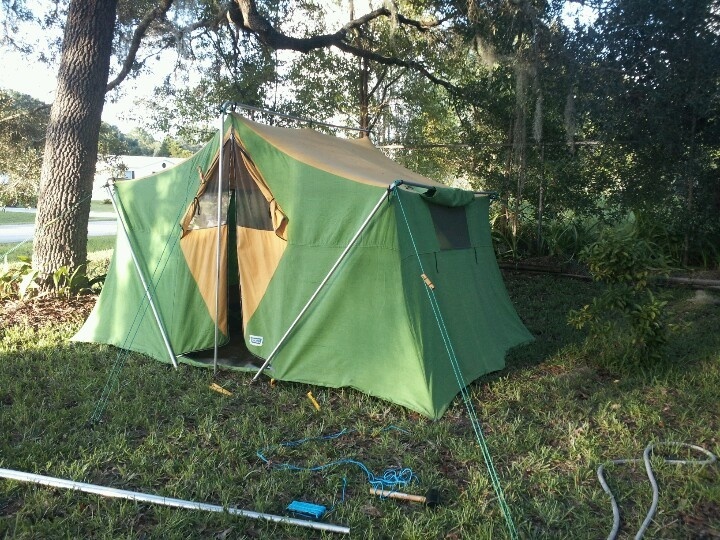 For example, they have an old tent that's difficult to setup and very heavy (kind of like this), and I'm sure sleeping on their old 1" pads will be unacceptable. We will always be car camping, cooking over camp stove, etc, so weight/size isn't generally an issue unless it's particularly heavy. What sorts of considerations, gear, practices, should I/we/they acquire to help them get back into car camping? My wife & I are both in our mid-50's, and we stopped going car camping a few years ago largely because of the lack of sleep and difficulty getting into and out of our tent. Our last trip we were so tired that I was hallucinating on the drive back home & we had to pull over on a mountain road to take a nap before we carried on. 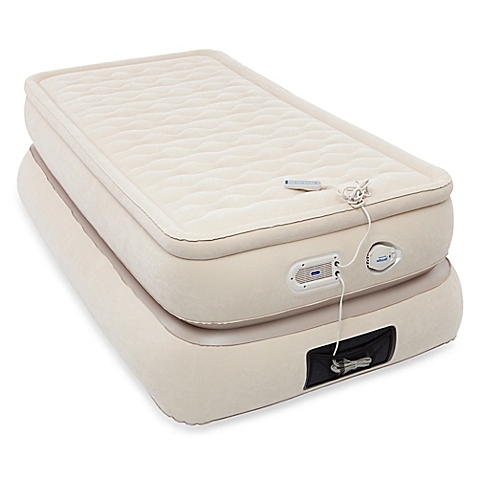 Even the nice mattress suggested in @shemseger's answer didn't solve the problem (we have a Coleman queen sized, very comfortable to sleep on, not so easy to get down onto or back up from). My biggest problem is arthritic knees, and to a lesser extent, arthritic back. 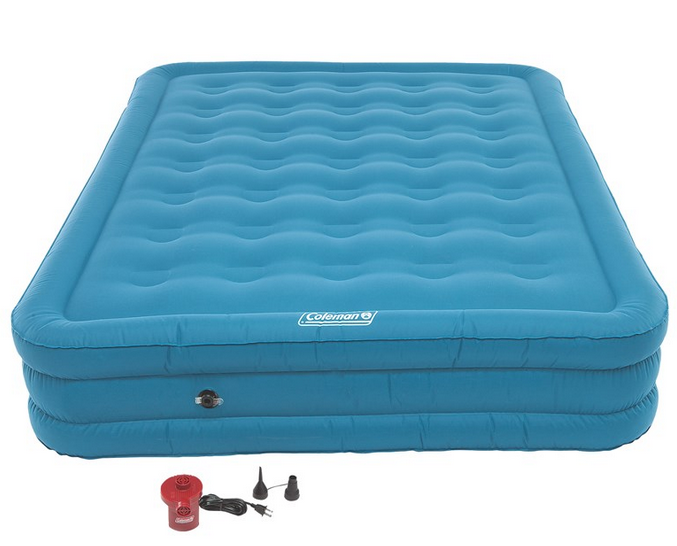 We've since bought a very nice cot from Cabela's and a very nice Thermarest NeoAir Dream mattress for me. We've yet to take them camping, but being able to sit down on the cot to get dressed/undressed, put on or take off your shoes, is a very-very nice feature. The air mattress just makes it better. My wife is much more spry than I am, so sleeping on a good air mattress (which we have, just can't remember what it's called) on the ground is still OK with her, but I think if we ever get back into camping, a cot for her is in the works. My brother has almost the exact one we bought, and she slept on it last time we visited, and quite liked it. As far as tents go, ours is still an older, fairly low (as in you can't stand up in it, not even my wife who's 5'-0"), style tent. If we were to start camping again, we'd look at much higher tents so there's standing room, at least in the center. It just makes things easier to do when your mobility is somewhat limited. The recommendation for good chairs is a very good idea as well. My arthritis makes sitting at picnic benches unpleasant pretty quickly. 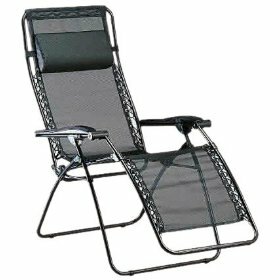 We have a couple of very good camp chairs, as well as one of the one's shown in the answer above. I don't particularly care for it, but my wife will fall asleep in it in moments if given the opportunity. The single most important consideration for your parents is going to be their comfort. For starters they must have something comfortable to sleep on or they're going to spend every day achy and tired, wishing they were sleeping in their own beds. The older you get, the more precious sleep is. If they can't get a good, comfortable night's sleep, then they aren't going to enjoy camping at all. I know a number of old-time campers who have given up tenting in favour of their memory foam posture-pedic beds for the sakes of their old back bones. Next item on the list would be a comfy chair, they will likely be spending a lot of time sitting down around camp, so make sure they have a nice place to sit. As far as tents go, I think it's largely up to them, I know a lot of old school campers who still prefer their beastie canvas A-frame tents because it's what they are familiar with and what they're comfortable setting up. So unless you're the one who is going to set the tent up for them, maybe hold off on getting them a new tent until they decide they want to upgrade (after going out once or twice with you and seeing how nice your tent is for example). If your parents gear worked for them 10 or 15 years ago. If the gear has not seen significant wear in storage. If your parents have remained in nearly the same physical condition (or better) as 10 years ago. The only thing they need to do is load their gear in the car and go. Seriously, it worked then, it should work now. Much of the older gear is better made than more recent gear, so it should be fine. People being over 60 has little bearing on camping. Regardless of age, if it has been a while since you went camping start close to home, give yourself extra time, and bring money for a motel room just in case. You say car camping - does that exclude a caravan ? A caravan is a significant investment in cost to buy. There may be somewhere near you that hires/leases/rents them. Some of the places you have camped may not permit caravans. There's a lot less setup and knockdown time too, its mostly set up already, and you have the option of using an electrically-powered site to run fridges and cookers, or be independent and unpowered. Plus you can bring more stuff, like camping furniture, and bikes in the caravan, leaving the space in the car for people. Basically, you have to be excited and welcoming. Encourage them, thats the most important part of it. For me Camping means getting back to the simpler life. Gear: I don't think that you need any sort of a special gear for older people when you are typically car camping. The normal car-camping checklist should do just well. Needless to say, add their daily medicine kit to things-to-take along with the obvious medical kit that you have with you. Extra Bedding, they might feel a bit colder than you do, so always have a comfy-cozy and may be some extra bedding for them. You might want to plan the food as per what they like more, than what you usually prefer to hog. I and other younger ones are usually okay with quick-grab food, mostly things with bread, while the older ones in my family usually like something domestic like a veg roll, etc. You might have to have word with them before you select what music collection you plan to have with you. (Johnny Cash, Pink Floyd and The Beatles shall obviously replace Eminem and Linkin Park, if applicable). Practices: The first thing I would ensure is, pick a place that you already have been to. Do not go to a place that you are not familiar with. Just drive easy and slow than you usually do. Pick the least bumpy road. Most importantly, I would allow them to have a good time doing the stuff they love to do, obviously with a caring-keen eye on them. 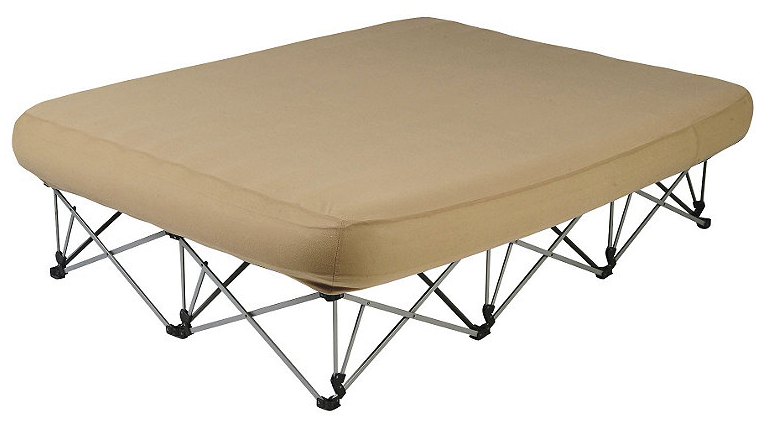 Generally these will end up being more expensive on a per-night basis than a regular tent spot. On the higher-end, some of these look really fancy. The main thing is just to do a practise run with their existing kit in the back yard, same way you'd do as someone starting from scratch. Ideally leave the tent up until it rains too, so you can check if it's waterproof. If it all works - don't mess with it. You can't beat familiarity when it comes to pitching tents. If something turns out to be broken, or if they're uncomfortable in the morning, you can deal with it and have another shot. My family took my Dad camping for his 80th birthday. We grew up camping with my Mom and Dad but it had been 20-30 years since my Dad had been camping. We brought all of our usual car camping gear for ourselves but we did bring a cot for him. I hate sleeping bags...too confining, so as usual we brought blankets and our own pillows. For his cot, I put several blankets on top of the cot for him to sleep on and then some to put over him. I always bring more blankets than we think we will need. You can always take some off if you are hot but you can't add more if you're cold if you don't have them with you. We also went "all out" on the food! We had filet mignon one night and lobster tails the next night. I cook all of the food over the fire. We took him to a campground that I frequent often and the owner was 85 years old and a charming man. I made arrangements for him to come and join us for our fire each night. My main goal was to cater to my Dad's comfort. We even went canoeing but we did bring a pillow for him to "buffer" his bottom against the hard seat in the canoe. He loved the whole experience! But I can say something about warmth and the need for leisure occupation. Layers become more important as one gets older, because not only is the cold felt more, but the ability to regulate becomes less. Take more varied layers than before, including a light fleece jacket that can either go under a down jacket or substitute for it. As one gets older, one loses stamina and endurance. Whatever your parents could do 10 years ago in terms of hiking, they probably can do less now. So there will be more time in that comfy chair that was pictured above. Maybe they need only the hypnotic sound and sight of a burbling stream to be content, but take along a Kindle (or variant) or enough books, if they are readers, or Scrabble or whatever games they like. Finally -- and it should have been first -- ask your mother. She probably knows exactly what she and your Dad need. Recently, I started backpacking again after a 20 year break. I still had my old equipment in the storage room. I tested my Coleman Apex unleaded gas stove and it worked fine. Then the first trip out the pressurized fuel line split open and started spraying gas out while the stove was lit. Fortunately, I got the flame turned off in time. My advice, buy new equipment. It's lighter than the old stuff too. Roof-top tent. I'm over 60 and there are lots of places I've never gone like national parks. It's easy to get up and into, and easy to get out. Unpacking and setting up the tent is simply popping it open - I lay out the bedding before I leave home. I have a 3" foam pad with a memory foam mattress topper. I just fold the tent down and push up the ladder when I'm ready to leave for the day or head to another park. I have a minimalist campsite: a tarp, a cookstove, one bin of cookware, utensils and plates and bowls, another of staples, and an ice chest. I splurged on one of the dense foam ones and don't need to buy ice every day. I set up a sun shower in the morning to heat water for washing dishes and I use a mesh bag to hang dishes to dry. I have a couple of comfortable camp chairs, full height ones, not the low riders. All this plus a duffle bag of clothes and towels fit into the back of my small SUV. Most important though, is that when I'm feeling like it's too much, I get a hotel room for a night or two. Or I can head home if the weather is really, really bad. Not the answer you're looking for? Browse other questions tagged tents sleeping car-camping or ask your own question. Two person sleeping bag liner for sleeping bag/staying in a hut?